I missed the boat abit on this topic, but here goes. Horses have always been in my family, my great grandad use to drive six but he also used to love drink so the hroses whee sold to cover his drinking habits. For some reason (i think it was money) horses missed a generation as my grandad and gran where not horsey people, but my mum was horse mad, she has lessons when she was small and bought her first pony (Peppie) from the Gypsis, Mum thinks she was about 11 at the time. I love to here her stories, she used to ride to all the local shows competed at prince phillip cup, attended every ponyl club rally and camp. At about 18 she discoverd men and gave up horses untill she had me, i have been riding since i was two in a basket saddle on the back of my little shetland pony Ben, i loved that horse so much, well i have had my own horse all my life and i know how lucky i am, but i have had to work hard to keep them. I fell in love with the arab at about 11, but Mum thought that they where to "flightly" for me (she still thinks this) so i was bought a lovley welsh section D, Master Jackson, he still is the love of my life he has tought me most, there is nothing he would not do for me, and at 33 i still have him, im not sure for how much longer, forever if i could. For my 23rd Birhtday my boyfreind bought me a yearling arab filly, she will be four in March and is currently away being backed and produced, i cant waight to be able to ride her.... I have three horses now, Old Master Jackson, a 15.3hh Irish sports horse who is a complete b*****d, who makes my life miserable as he really hates me and my arab. I hope to meet you all at some shows in 2007, i will bring her out as a five year old, she needs that time to mature. I started riding at 6 years old and helped out at local riding schools and got my first pony at 11 years old. Lady Beau was a 13.1hh bay part bred mare by the purebred stallion Prince Merlin now with Jo Claridge. I grew out of her pretty fast and started looking for something around 15.2hh when I was 13 years old. I didn't look for an Arab and tried lots of different horses until a friend saw an advert for a 15.2hh 8 year old chestnut purebred gelding in a local paper. I went to see him at a riding stables in south devon and when I got there he was standing half asleep in a stall. Anyway we went out for a ride and he couldn't have walked any slower if he'd tried so I was thinking - boring. Well then the lady asked if I wanted to canter, I said yes, and we were off!! When we pulled up I had the biggest grin on my face!! I got back to the stables and jumped him in the paddock and that was that I had to have him. Eleven years on and that was the best decision I have ever made!! He has got to be the sweetest, kindest natured horse I have ever met and I would trust him completely even with my two year old niece. We did everything including Showing Inhand and Ridden, Hunting, Showjumping, Cross Country, Sponsored Rides, Race Training, Carnivals and lots of hacking!! I even got him registered so I could show him at Malvern in 1997 where we were 4th in the young riders and had two 4th's in the showjumping. Tom is still number one in my eyes and it is down to him that I now have a collection of Arabs. I have always wanted to breed a foal and in December 2002 I bought Polmartin Rain and put her in foal to Chi Lin Tienshan in 2003. In 2004 I had the opportunity to buy Taragun another purebred mare whom I had known for many years with the plan to breed a foal from her and to sell Rain once her foal was weaned. Well on the 3rd of August 2004 Rain gave birth to the most beautiful filly foal Eleanor Rose and well lets just say that neither will be going anywhere!! Looking forward to showing her again this year! I came from a non horsey background. My parents told me my love of horses started when I was 2 years old. At 11 years of age I started riding lessons and for my birthday was given the first 3 books in the "Jinny" range. I was totally smitten. i loved this Shantih more than life itself. I drew pictures, I wrote stories about me and Shanith, I rode an imaginary shantih to school every day! I used to sell my paintings of Shantih too! The prince of Orange on the front was like a special dream. I used to cry thinking I'd never have an Arab. The I watched the black stallion and I saw how I imagined an Arab to move. I remember absolutely sobbing over the film at the end because I loved Arab horses so much, I cried in a camp I had made in some trees!!! When I was 14 a new bypass was made in Ashford, (where the outlet is) For the first time I could see horses in a field. Me and my friends decided to take a walk to see them. They were part Arabs but very Araby!!! There was a chestnut, she to me was shantih!!!!!!!!!!! I got friendly with the breeders and I was allowed to do what I wanted with the horses! well this chestnut was totally wild, wouldn't let anyone come near her, but within a month I was riding her, she was my dream, although not pure bred. I've had her for 12 years now (bought her when I was 18)We had many adventures, much like the books!!! I think the book and I are connected! No word of a lie, because my Shantih is the cousin of the prince of orange!!! And i draw like Jinny! Maybe i was suppose to find and tame this wild mare!! Anyway I am now in the process of buying a real PURE bred chestnut Arab mare with four whites and a blaze if anyone knows one for sale? My girl is 22 this year and only 13.1hh so i want to find a bigger Shantih!!! Please help me if you can! I'm so excited!!! 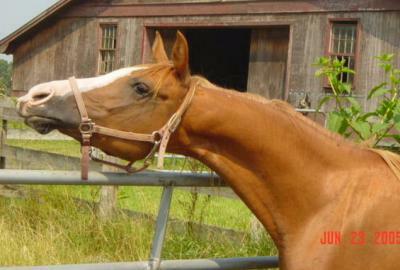 heres a pic of my Shanith, my first horse that was my dream mare! Aw,love your story Karen!I was mad on the Jinny books too,to the point of obsession as you described!I used to write stories and dream about a dapple grey Arab-and I got my dream too!Your Shantih is beautiful,what a mane and forelock!Good luck with your search! Libby really was that the one with the really white face?? I love the prince of Orange's blaze, so unique I used to be able to draw his markings off by heart! Very nice story Karen, good luck in your search but you will know instinctively when you find the right one! Thankyou! I can't wait I feel like a little kid again! Arabmare, your shantih is absolutely beautiful! that headshot is so lovely. she looks such a character too. lucky you! in the '70's/'80's my grandparents lived next door to an Arab stud farm called Lythe Farm Stud, nr Petersfield in Hampshire and i spent every minute there with those magical horses. They had 2 stallions called Royal Storm and Royal Tempest (anglo) and many mares and foals. Mystic Mountains of Arolla, Sari, Sahrani, Royal Sirocco, Royal Zephyr are a few of the names i can remember. have tried tracing some of them but only Royal Storm and Sahrani seem to have much of a history. i was totally absorbed by this idyllic place, the owners must have rolled their eyes and groaned everytime i appeared on their doorstep to 'help' for weeks on end! to their eternal credit they were extremely patient and let me help feed, bring the horses in, handle the foals, ride the odd one but funnily enough the riding element didn't interest me as much as caring for them. those foals... one day i will breed my own arabs and live somewhere like that magical place. Also around this time became obsessed with WH Smith's Win a Pony Competition, does anyone else remember that? palomino pony on the front, i literally dreamt i won it once! and on the telly? Champion the Wonder Horse, Black Beauty - that music can still reduce me to a heap in seconds and White Horses, - snowy white horses - the wonderful dubbed eastern european b&w programme. My best friend and i used to spend all our spare time mugging local horse owners to let us 'help' with their horses, the thrill of being allowed to carry the headcollar or wow the tack!! we also used to get on strange ponies in fields, to this day i cannot believe we did this, not knowing whether they were broken or anything. give each other a leg up and just sit on them for a bit! at 18 had a lovely part arab mare on loan, she was such a sweetie but had to give her up after a year as completely poor at that time. never stopped thinking about arabs though, went to Malvern year after year (in fact the kindly stud owners even took me to Ascot many moons before) and always imagined i was the only person there who didn't own a horse. 6 yrs ago i woke up one morning and decided i had to have an arab mare, like you do. two weeks later i was at the Maxwells loading up my gorgeous dapple grey arab mare, Kuraishiya. i still have to pinch myself sometimes to believe that she is really mine. still dream of breeding one day, in fact when i see the foals on here and funnily enough that lovely picture of Aboud out in his paddock i just yearn to live somewhere like Lythe Farm. jaj , you post is lovely!!! i remember the WHSMITH compettion!!! i entered it too , ! its a lovely feeling having your won ..finally! i still pinch myself about how lucky i am to have my too! it really is the pony club dream come true! I am new to this forum but when I saw this thread, I just couldn't resist telling my story. I am 25 years old and believe that the image of an Arabian was burned into my mind at the instant I was born. I have no idea where it came from and neither does my family. I grew up watching any movie I could find with a horse in it. I collected Bryer Horses, posters, magazines ( The Arabian Horse World and Arabian Times and still have them to this day ), books, anything that even mentioned a horse. I never took riding lessons and didn't live near any farms as a child. I had to be content with my own imagination. I drew a lot ..pencil to paper bringing the images of my mind out and set them free across the white page. When I turned 14 my family made the decision to move out into the country.. my first horse soon followed. He was a little registered Arabian colt named Draven that could have looked like a donkey but would have always been the most beautiful horse in the world to me. He was barely halter broke and 6 months old, probably not the best choice for a 14 year old girl who had rarely even sat on a horse much less worked with a youngster. He grew up into a nice looking young horse and my father sent him to a trainer for thirty days...what we got back was definitely an improvement but probably still not somthing I should have been riding with no real experience. We both learned from each other.. I did something stupid, he threw me off and ran away and I learned not to do that again. He was a great teacher. Dravens breeder ( who soon after the purchase of Draven would become my stepfather..but that is another story for a different kind of forum ) bred Arabians and had a herd of about 20 or so and that was my first real glimse into the "Arabian world" When I was 15 I was introduced to friends of my stepfather's, a wonderful older couple with an extreme passion for the Arabian horse. By 16 I had a job working on thier farm and to this day it was the best job I have ever had. Among thier horses was a stallion named Remi Marten ( Cognac X Alpine Wind Song ) that instantly captured my attention as well as a band of broodmares that made my jaw drop. 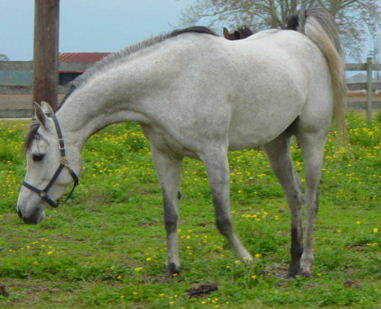 I fell head over heals in love with a grey Arabian mare they had named LF Aerial Whiz (SHF Southern Whiz X Amika Destin ) and spent my days dreaming of her. She had more "personality" than any other horse I have ever known. She would instigate "hide and seek games", "chase", and would spray you with the water hose if you gave her the chance. Beauty and a sense of humor, I was in love. When I was 19 they offered to sell her to me. I will remember that day forever. The only condition was that Aerial was pregnant and I had to wait until after the foal was born before we would move forward with the sale. Things however, would not work out as we had all planned as Aerial passed away soon after giving birth to her second foal CLA Whizkas.. another filly. I was devistated and remember feeling like i would never want another Arabian.. because surely no other horse could measure up to Aerial. Whizkas or Bunny was sent to another farm to be bottle fed and from there was sold, that was the last I really saw of her. I continued to work at the farm and without even realizing it started to form a bond with Aerials first foal, a then two year old mare named Sheena. By 21 the owners of the farm were starting to have failing health and they decided to sell off the majority of thier herd. I was approached on whether I would like to purchase Sheena and before I even realized the worlds that had come out of my mouth.. I shouted yes. That is pretty much when it all really began. Soon after the purchase of Sheena I began building my own breeding farm. A few months later I purchased my stallion ( an Andalusian, another passion of mine but best left to another forum I suppose ) From there the hunt was on. I was determined to find Sheena's sister... the little filly I hadn't seen since she was a few days old. As fate would have it .. one summers day in 2003 I found myself wandering around a local horse auction and happened to run into an old friend. We talked briefly and she just happened to mention that she had a little mare that she was thinking about selling that she thought I might be interested in. My heart stopped as my brain came to the realization that she was talking about the very horse I had been searching for. My only response was "she's sold" without regard to price, training experience, or anything. Whizkas or Bunny as she was known then arrived at my home on Easter of 2003. My girls were finally back together again and at this point are inseperable.. In 2005 I purchased a little chestnut mare with Sabino markings ...who reallly opened the door for me as far as pedigrees go. I have found myself trying to learn as much as I can about lineage and the history of the Arabian horse. I guess you could say I have the disease as well.. an infectious thing that clouds the mind and prevents it from thinking about anything but the addictive Arabian horse. I have found myself at 3am on more than one occasion pouring over for sale ads.. always on the look out for my next "fix" like a regular junkie.. With each passing year my herd seems to grow and my passion only grows deeper. At night my dreams are filled with that next Arabian, one that will surely captivate me and begin a new chapter in the ever growing Arabian story that is now my life. I wouldn't have it any other way. Hi Kim, Great story - how fantastic that you have the horses you always wanted. That's a lovely success story and you must be very satisfied. I also have the only Arab I could ever have wanted - fate sorted it for me somehow. Like you I also have an Andalusian. The grey in your profile details looks just lovely with her foal. Thanks Roseanne. 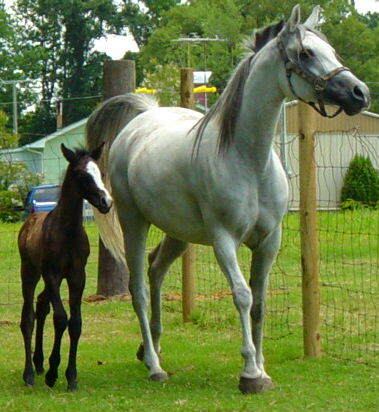 That picture is of CLA Gin Whiz ( Sheena ) and her 2004 half Andalusian colt, LF Jose Cuervo. I actually lost Jose Dec 12, 2005 in a freak accident as best described by my vet. He was set to leave for his new home in Michigan just one week later. On Dec 17th, 2005 the owner of the horse farm that I had worked at all of those years and really supported me in my decision to breed horses also passed away. It was a really rough Christmas last year. So far things are really looking up for this year as I have three mares schedualed to be bred to my Andalusian stallion and have one outside mare ( Pre Andalusian mare ) here right now being bred to him and another mare ( half Andalusian ) schedualed as soon as this one leaves. I know this is an Arabian forum.. but you have captured my attention now... you have an Andalusian as well? I would love to hear more about it. Here are a few pictures of my sweet girls, I would love to hear what everyone thinks about them. I'm not sure if this is where I am suppose to post these.. but I just wanted to share and hear what you guys think about my girls. I have posted all of their pedigrees under the pedigree thread in hopes that someone can shed a little light on their lines. I would love to hear anything that anyone can tell me. Super horses Kim. I'm not a bloodline expert but there are many others on this site who are! My Andalusian is called Otan III, by Granero IV x Oretana (III I think!). I kept him entire until he was five, during which time he was graded by the Spanish MoD who make an annual visit to the UK to grade all PRE stock before they are allowed to breed. Otan graded very well and has been a fabulous riding horse. I gelded him because I wasn't going to use him for breeding myself and felt it easier to have him able to mix with others, and to be left safely at shows with other horses. He's very athletic, gymnastic and extremely trainable. The temprament of Andalusians is fantastic and they are most comfortable to ride. They have that hotblood way of Arabs and it's not surprising to me that many of we Arab lovers are also Andalusian enthusiasts. I'm still not sure about posting pictures on AL but will look at the instructions again and see if I can't get an image down here! How very sad that you lost your Hispano Arab foal. You must have been devastated! I do hope 2006 is feeling like a luckier year! I come from a non-horsey family (although my maternal grandmother at some point had a milk round with a pony) but my sister and I were both obsessed with horses... did the usual: pretended my bike was a horse, made 'showjumps' in the garden and galloped over them (sometimes on my hobby horse, very hard to get a clear round!) I too entered the WH Smith win-a-pony competition, plus tried for Jim'll Fix It to have lessons/go trekking. Eventually was allowed lessons when I reached 12, but only in the summer due to my sister having been bucked off in winter (the school said it was cos it was cold, but more likely due to the pony being unbroken). The lessons were much enjoyed, despite being at a truly appalling school - I fell off on the second lesson while JUMPING due to the girth not having been done up - but what the heck. I stopped for a bit then started again when I got married at 20: and this time went to a really good school. Then we moved to the West Country and had an excellent one-on-one instructor, then started riding at the army saddle club - where I met the mare who was to be my first horse. She was certainly part-arab - possbly purebred (in subsquent years at shows I had two arab breeders ask me her breeding) - and I had the best time with her. Of course, she had the advantage in that she was completely bombproof (as in literally: her stable was next to the machine gun range) and aircraft-proof (someone - not me, before my time - once galloped her alongside the runway as a Hercules was landing). We started to look for another horse straight away as couldn't bear not having one around - and after one or two false starts, realised that really what I wanted was a purebred arab... so started hunting. Serendipity played a big hand in our seach and we found my beautiful and adorable Old English girl, Amelia. What more can I say? I still miss Meg bitterly (I loved her so much, awkward and temperamental old wotsit that she was!) but Amelia is wonderful. It look us a looooong time to 'get it together' but we have it now and are steadily building on a nice strong foundation. She is pretty, and kind, and affectionate, and clever, and knowing, and... well, she is herself! So that's my story... and now I am a certified born-again Arab horse fan! What a great topic! I have loved horses since I was a small child. I come from a non horsey background, my mum used to work at a big manor house. They had two big and very gentle horses stabled there, and whilst mum worked I was often found just sitting with them, talking to them and feeding them carrots. Maybe thats where my horse infatuation began!? I started riding lessons about 7 yo at a riding school where basically if you didn't shape yourself, you fell off! When I was about 12 they bought a 14.2hh chestnut arab gelding. He was the most magestic creature I had ever seen. Such a calm and placid guy..it was love at first sight! About 2 years later, the YO drove the horsebox onto the yard, backed it up to the arena and cut the engine. The noise that ensued from inside was quite frightening! She dropped the ramp, and what immerged can only be described as a thundering flurry of gingerness! All legs and ear piercing shrieks! She wasn't suitable as a school pony, that was more than obvious, so I formed a special bond over the years, with the cranky chestnut mare who no-one wanted to have anything to do with. I worked there after leaving school, but it wasn't what I expected so I left. A few months later I called by to visit. Greeted by old friends and clients, i couldn't wait to see how Honey was. The kids told me she was in a stable near the top of the farm, out of the way. They were all afraid of her and apparently no one bothered with her. Off I trotted, mints in hand to see my old friend. The sight that greeted me as I entered her dark smelly stable broke my heart. She was standing in inches of muck, her coated caked in it, the fromt of the stable barred up. She looked petrified. I ran out of the stable and down to the car where my mum waited. I couldn't stop to talk to anyone, I just had to get home. I cried myself to sleep that night, feeling so guilty for leaving her yet not knowing what to do. The YO had always said I could have first refusal on Honey (knowing i couldn't afford her) of �850. So I called my dad and tearfully explained. He agreed to give me the money, and mum called the YO, made her the offer, and she accepted. We collected my poor bedraggled mare, who all but carted me into the back of the horsebox. It was as though she knew she was coming home. 15 years on and we are still together...she's 28 now and still as potty as ever. I wouldn't have her any other way! When I was 2 my mum purchased a beautiful chestnut arab filly named Rissky. She was her dream come true and was shortly followed by a Shetland called Rusty for me, a native pony called Topsy for my brother and a stunning 16hh silver dapple grey arab gelding called Mishlah. My first riding experiences were riding in from the field and around the yard on the unbroken Rissky - she was the most gentlest mare you could imagine and absolutely in love with my mum (and mum her!!). However, I wasn't so keen. I didn't like my shetland very much and soon refused to go to the stables. With 4 horses and 2 kids (one who refused to go to the stables) and not much money, mum had no choice but to sell some of them. She put both Rissky and Mishlah up for sale and it was Mishlah who went (he went onto having a very successful racing career). The ponies also went and so mum was just left with Rissky. Rissky was as dear as us to my mum and so we were soon on the lookout for a place with a little bit of land where we could keep her safely (she was always bullied by the other liveries). When I was 10 we moved to Kent where we are now. Our house has a small paddock and a stable and backs onto a small stables owned by our neighbour. Being 10 and in a new place I wanted to make friends and soon drifted over to the stables. Soon I had 2 ponies on loan (a 12.2hh Welsh speed demon and a very sensible 13.3hh Palamino who was a fantastic little jumper). By the age of 13 I thought I was ready to take on the show jumping world by storm and moved up to loan a 14.2hh pony at the big yard up the road. The pony's owners decided they wanted to sell him, however my parents weren't that keen, so the search began for my first proper horse. It didn't take long, I saw Prince (a 15hh chestnut Anglo Arab) in the H&H went to see him and brought him straight away. he was only 4 years old but what a star - we were at a local jumping show within the week! We had so much fun - I did all the pony club exams and camps on him, competed every weekend and loved every minute of it. Everything was going well, mum had Rissky and I had Prince - we would hack out together etc. Then very sadly at the age of 13, Rissky got colic and died. My mum was absolutely devastated and I really didn't think she would get another horse. But after much searching she found and fell in love with Walfrieds Neptun (a.k.a. Pasha) a 15.2hh bay gelding, 6yrs old just out of racing and just gelded! Pasha was not a hit with the family - he bit me, my dad and my brother... the first time I rode him I took him over the field where he tripped down a hill flinging me forwards, then took off across 15 acres!! I have never been so petrified in all my life and needless to say did not ride him for some time afterwards! But mum and him got on like a house on fire and it was soon clear he was here to stay. Then horror struck! Pasha and my mum were hit on the main road by a car! Pasha was fine but my mum was crushed between him and the car and was in intensive care for 3 months. We nearly lost her! It was such a hard time for all of us and I had just started my A-levels at school. It took such a long time for mum to recover. My dad wanted to sell Pasha and I think my mum seriously thought about it too. With 2 horses, A-Levels and a part-time job it wasn't long before riding was last on my agenda, and Prince only being 8 i made the tough decision to sell him. I was heartbroken but I know it was the right thing for him. Pasha, thanks god, was never sold. Since leaving university and starting work I began riding again - mainly hacking out at weekends at first building up to full blwn back into it and wanting another one!! Even though Pasha is my mums horse and wouldn't have been my choice at the time, he is everything you could with for! He's grumpy old man character just makes me love him even more... he is 110% bombproof on the roads (incredible after the accident) and a fantastic little horse in the school. We did our first dressage tests this year and came 4th and 7th and won our first showing class under saddle out of 12!! He is my dream come true and at the grand old age of 19 i realy wish I could have seen what my mum saw sooner!